Looking for an elegant appetizer that highlights the ripe figs of summer yet is still really easy to make? Look no further than these fig and goat cheese crostini. It uses both fresh and dried figs for a double dose of fig flavor. 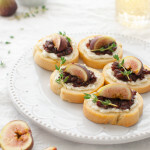 Dried mission figs are used in the savory jam that gets spiked with a little port and some thyme. And because it uses dried figs, you can still enjoy these tasty crostini even if you can’t find fresh figs. Just the combination of the fig jam and goat cheese are enough to make this recipe. Don’t be put off by the thought of having to make your own jam. This jam comes together in less than 30 minutes and tastes fabulous. The hardest part might be chopping the dried figs. Be sure your knife is nice and sharp and you’ll be good to go. These crostini also make really good snacks (speaking from experience). You can keep the jam in the fridge for several days and just make a few toasts at a time as the mood strikes. If you’re really in a hurry and want a quick snack, you can forgo the baguette slices and use your favorite crackers (my daughter recommends Wheat Thins). It’s a slightly different taste but works in a pinch. Melt the butter in a small saucepan over medium-low heat. Add shallot, thyme sprigs, and bay leaf. Cook until shallot is softened, about 2 minutes. Add dried figs, Port, salt, and pepper and bring to a boil. Simmer, covered, until figs are soft, about 10 minutes. If there is still liquid in the saucepan, remove lid and simmer, stirring, until most of the liquid is evaporated, 3 to 4 minutes more. Discard bay leaf and thyme sprigs. Let jam cool. Stir in minced thyme. Add salt and pepper to taste. While jam is cooking, make the toasts. Preheat oven to 350 degrees. Arrange baguette slices on a baking sheet in a single layer and brush tops lightly with olive oil. Bake until lightly toasted, 7-10 minutes. Let toasts cool. To assemble crostini, spread each toast with a generous teaspoon of goat cheese. Top with 1 teaspoon fig jam and fresh fig slices. Garnish crostini with small thyme leaves or sprigs, if desired. Fig jam can be made up to 5 days ahead and kept covered in an airtight container in the refrigerator. Bring to room temperature before using. Recipe adapted from Gourmet, September 2003.